Are Alpen Spotting Scopes Worth the Money? Home Are Alpen Spotting Scopes Worth the Money? Have you ever noticed that many activities such as hunting and bird watching require you to locate far away objects? Target shooting and spectator viewing also depend upon these requirements. If you’re serious about your observations, you’ll need a serious spotting scope. Spotting scopes deliver larger magnification capabilities than most powerful binoculars. In addition, many spotting scope eyepieces can produce magnifications of up to 60 times or higher. The optical quality of a spotting scope can be the difference between a truly enjoyable outing and a frustrating experiece. Consider an Alpen Optic spotting scope for your next outdoor adventure. The Alpen company prides themselves on providing superior products at affordable prices. Their commitment to quality is exemplified through their lifetime, no-fault warranty. It’s no surprise they’re one of the best companies in the optical industry. 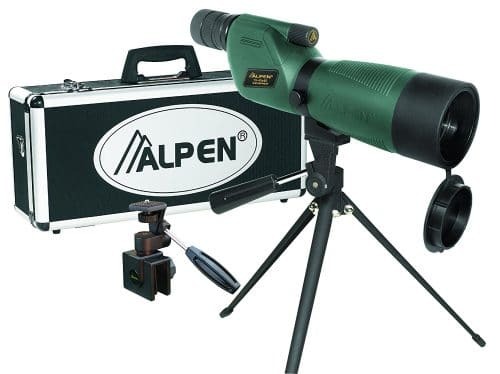 Established in 1997, Alpen provides a strong line of binoculars, spotting scopes, rifle scopes and more. The California-based company produces more than 70 products and accessories full of benefits one would find on a more expensive brand. They also provide different ranges from entry level sport series to their world class Rainier top-of-the-line spotting scopes and binoculars. If you’re a committed spotting scope user who needs an exceptional optic that performs in all weather conditions, Alpen is a great choice for you. All of Alpen’s spotting scopes are nitrogen filled, waterproof, dust and debris free and shock resistant. Featuring powerful lenses, most of the Alpen models come standard with a padded field carrying case and a portable 12-inch swivel-head tripod. Designed to spot your target with accuracy and clarity, this spotting scope not only makes your targeting simple, it also makes your shooting fun. The 20-60×80 offers superior spotting qualities, is easy to transport and is extremely user-friendly. With an 80mm objective lens, the Alpen 20-60×80 can achieve zoom magnification from 20 to 60 times. With the 20x magnification, you’ll want to reach out and touch the clear, razor-sharp images that appear as if they were right next to you. This model boasts fully multi-coated optics and its 80mm objective lens allows in an incredible amount of light — perfect for early morning or late in the evening. This scope’s amazing light transmission is one of its many features that sets it apart from other spotting scope models. Because it’s waterproof, shock-resistant and dustproof, it can perform splendidly in all types of weather. 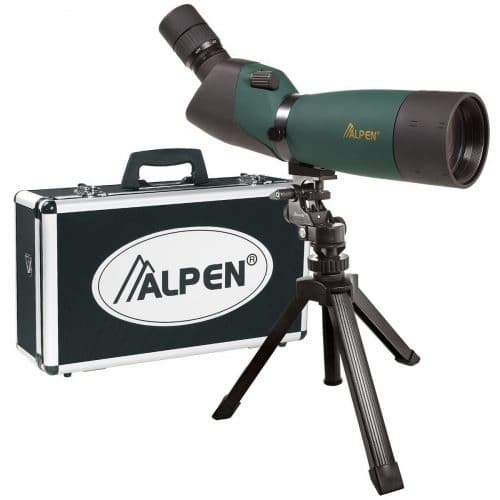 The Alpen 20-60×80 spotting scope features BAK-4 fully multi-coated optics. These high-end optics provide superb brightness, perfect resolution and exceptional clarity. The 45-degree angle eyepiece is especially useful for star gazing or viewing anything at a steep, upward angle. Additionally, the included rotating tripod mount is great for use on shooting benches. Lastly, O-ring-sealed optics keep water out completely. Besides the appealing price tag, the Alpen 20-60×80 is one of the most durable spotting scopes you can find on the market today. The Alpen 20-60×60 model is an ideal choice for hunting in the backcountry, birdwatching in a park or shooting on a benchrest. Just as the 20-60x80mm, the Alpen 20-60×60 angled spotting scope is equipped with fully multi-coated, BaK-4 glass prisms guaranteeing uncomparable brightness, resolution and clarity — regardless of your target. The Alpen 20-60×60 model updates the original with improved eye relief and extended lens coatings. The scope close focuses to 20 feet at 20x magnification and has a 107-foot field of view at 1000 yards. Completely waterproof, the 20-60×60 spotting scope is nitrogen-purged to be internally fogproof and dustproof. In addition, this spotting scope carries Alpen’s lifetime no-fault warranty, weighs 37 ounces and is a compact 13.75 inches long. This lightweight, compact spotting scope by Alpen is a straight viewing spotting scope with a 60-mm objective lens. Made with multi-coated BAK-4 glass prisms, it’s completely waterproof and fogproof. The Alpen 15-45×60 spotting scope kit includes the scope itself, a swivel-head, and a mini-tabletop tripod. All of this is packed in a handsome durable aluminum, foam-filled carrying case. Extremely versatile, this scope has magnification which provides panoramic viewing at low power and close-up viewing of distant subjects at high power. 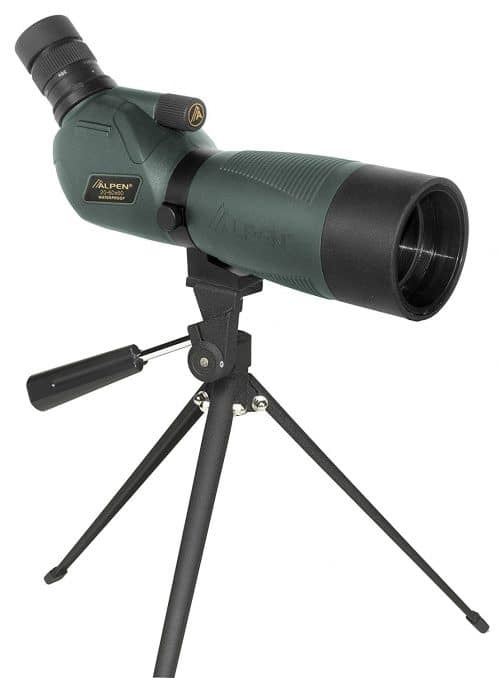 This spotting scope is perfect for hunting or birding out in the field or in your backyard. And with the retractable sunshade for glare, you’re good to go. Weighing just 24 ounces and measuring 13 inches in length, the Alpen 15-45×60 will close focus (at 15x magnification) to 24 feet and has a 115-foot field of view at 1000 yards. Besides being waterproof, the Alpen 15-45×60 is nitrogen purged to be internally dustproof and fogproof. And as always, this spotting scope is backed by Alpen’s no-fault warranty.